The emojis on the Backpage adult listings might look cute & inviting at first; however, six particular emojis masqueraded as something else far more sinister. Some of the emojis were a secret form of communication for buyers from traffickers. The emojis would indicate certain things about the victim being advertised. Things such as an incall only victim with restricted movement, if the victim is underage, and prices of their sexual services could be deciphered by the innocent emojis. There were six emojis that stood out as being the main indicators of trafficking. These included: Rose, cherry, cherry blossom, growing heart, airplane & crown. We used the keywords that were indicators … ran the machine-learning software against the words and the emojis, and how they appeared in the ads, and were able to interpret what the emojis actually meant. Graduate student Jessica Whitney and her thesis advisor, Dr. Murray Jennex worked to decode the hidden language of trafficking. After analyzing 8,000 Backpage ads in three California cities, the results were surprising since most of the ads contained emojis. This led Jennex to question the meaning behind the emojis. The duo continued their research by using keywords that were indicators. They developed a machine-learning software to detect data of how the emojis were shown in the ads. Whitney went on to developing an algorithm to decipher their data. The algorithm even had the capability of adapting to any changes in language over time. It could sift through both ad listings of words and symbols such as emojis. An automated monitoring tool, if developed, could aid law enforcement officials in more quickly accurately locating potential victims and being able to monitor online ads in real-time. Jennex & Whitney even had plans to develop an automated monitoring tool as mentioned in the quote above; however, there aren't any Backpage adult ads to monitor anymore since the website is shutdown now in order to combat trafficking! There's supposed to be an alleged fight to repeal this new illogical law this month. This isn't the first time the government has carelessly passed an ambiguous law. After they notice issues arising from its passing, they develop a bit of self-awareness upon realizing that they are idiots. I'm certain this particular history will continue to repeat itself. 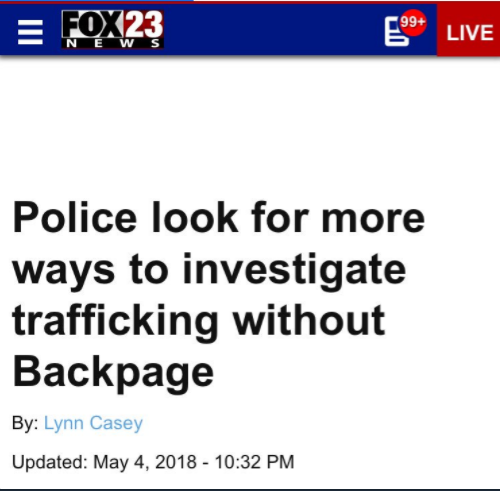 I always remember seeing those emojis on Backpage's listings. I would just mindlessly scroll through the page without even noticing an insidious underground exchanging right in front of me.